The Koto has movable frets and allows tuning in various scales. Usually it is tuned in pentatonics. Koto and tanpura are both placed on one side of the instrument. 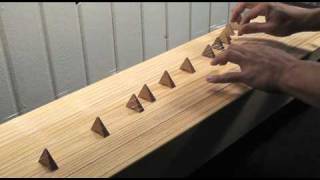 When the Kotamo is placed upright it is possible to play on both sides simultanously. One hand plays the Monochord, the other one improvises on the strings of Koto and Tambura.